The art of tattooing has exploded over the last five years in Greece. Whenever you go here, it’s likely you’ll find a tattoo studio right around practically every corner. Quantity over quality? Exaggeration and hyperbole? Welcome to Greece! Truly, there are now so many good tattoo studios and artists that you’ll forget the bad ones (unless you had a bad tattoo recently and now it’s too late). Among these are some legendary old school tattoo studios and many newer additions, but SAKE TATTOO stands alone as one of the best and busiest studios in Athens, located in the rather hip Chalandri suburb, with a second studio to open in November. SAKE is the artist/founder and ROZA and DASK – a familiar name in the local hip-hop scene – are some of the top notch artists working at the SAKE TATTOO CREW. I paid a visit to the SAKE TATTOO studio below and got to talk to the three artists. MANOS: When did you start tattooing and when you did realize it would evolve into a career? SAKE: I was a graffiti writer from early 1994. I was looking for a job around 2000-2001 and got this opportunity in a local tattoo studio, working on sketches and drawings. When I saw one of my early drawings turned into a tattoo, I got really excited and thrilled! It was the moment I realized the power of tattooing – seeing one of my drawings in the body of a person I never knew. A drawing that will follow this person for the rest of his life! Right from the next day, I saw myself as an apprentice in the tattoo world and started taking things more seriously. I never expected this to be my full-time thing, [but initially] a job to help raise my family. When did you open your own studio and what were the challenges you had to face back then? Sake Tattoo Crew first opened it’s doors in 2005. It was very hard for me in the beginning. Tattooing was an art form for me and not something decadent and barbaric. There weren’t really any photorealistic tattoos back then in Greece, so it was hard to explain to people there will hardly be any lines, but more of shadings, something more close to a photograph. Time and people change and right now my job has become more pleasurable. How was the tattoo scene in Greece back then and how is it now? Totally different eras, totally! You couldn’t easily find the best tattoo supplies in Greece back then, the right parts, accessories and so on. It was even hard to find new ideas and get inspired since very few international tattoo magazines were sold here and the Internet was in its early stages. Nowadays, people really love tattooing! You can easily find tattoo supplies and the Internet has helped a lot. The artists also evolve and [are] getting better so fast. After all these participations and awards in the biggest European tattoo conventions, do you feel Sake Tattoo among the elite crews in Europe? I want to believe our crew stands equal in the art scene of Europe. For real, I feel very happy of the acceptance so far. Hard work pays off. All our artists have helped all the way through till now and we are all glad to see them now have international careers and earn many awards. That’s how the reputation and word for our studio grows strong! Recently you also founded STC Publishing with the release of some really cool books, artist monographs, sketchbooks and art prints. STC Publishing is part of the Sake Tattoo Crew, run by artist Orge. Sake Tattoo exists from our love for drawing and design and this is the best creative way to do something beyond tattooing and have some of our designs and sketches see the light of the day. 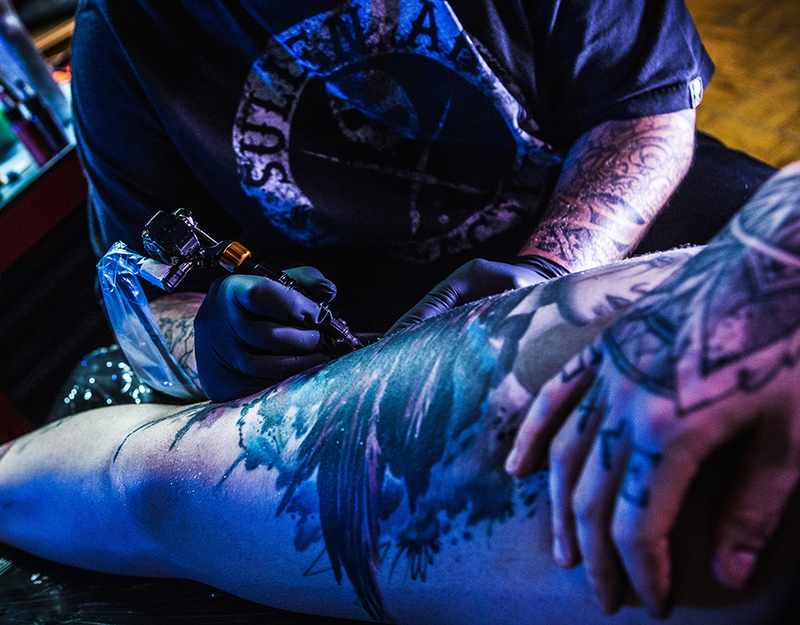 How do you see the tattoo world in 2014? I can clearly say that tattooing is one of strongest art forms of our days. More people do tattoos and this also goes out to all the new tattoo companies involved, conventions, and more. 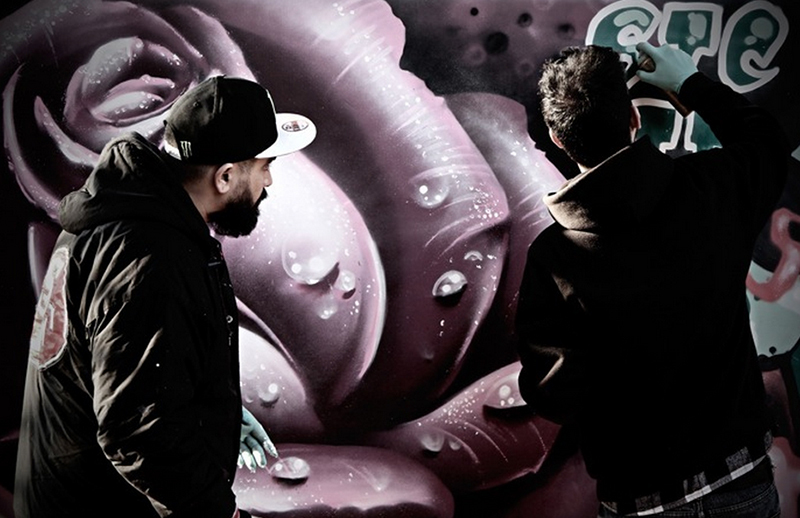 MANOS: From rap and graffiti to the world of tattoo. How did this transition happen? Do you see close elements to these cultures? 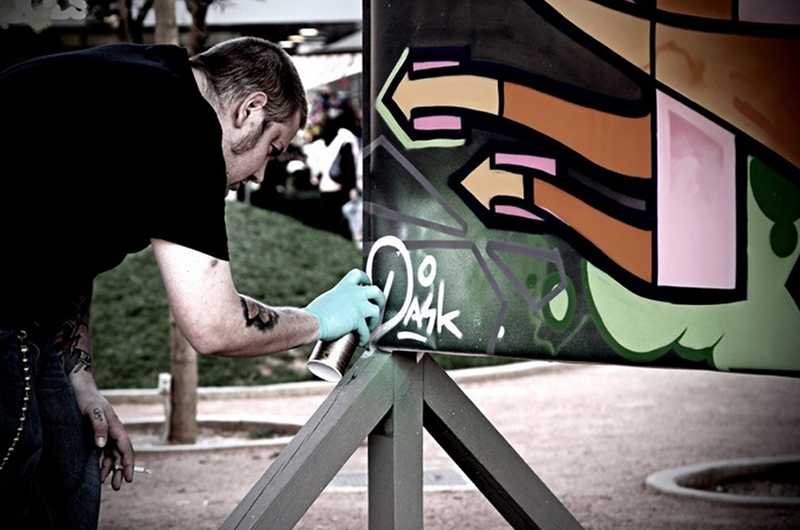 DASK: Rap and punk are two music genres getting inspiration from the streets and the urban landscape. This is the element I can see in the tattoo world as well. Music is my biggest influence and inspiration. It is a way of life and this way of life is transmitted to my art. 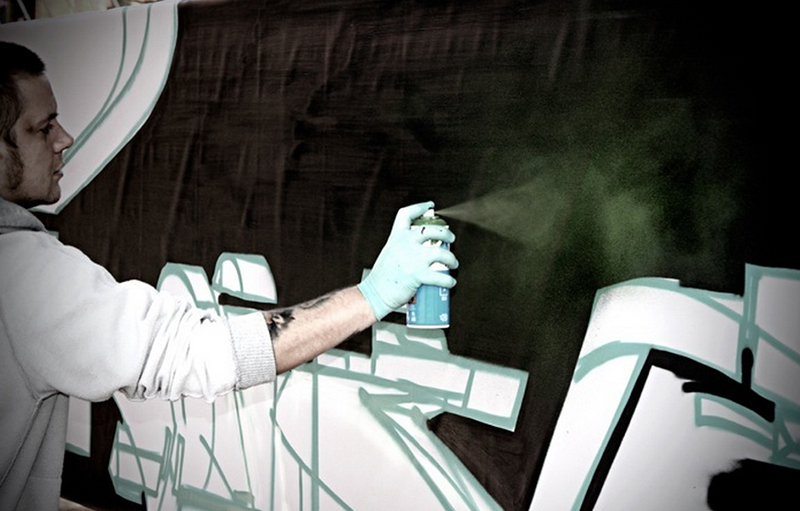 My involvement with graffiti has really helped me understand more of the tattoo world, the color and lines. You can never get graffiti off yourself, same goes out for tattooing. What’s your style and how it has evolved? From the [get-go] I always liked the neotraditional tattoo movement and decided to get involved with it. 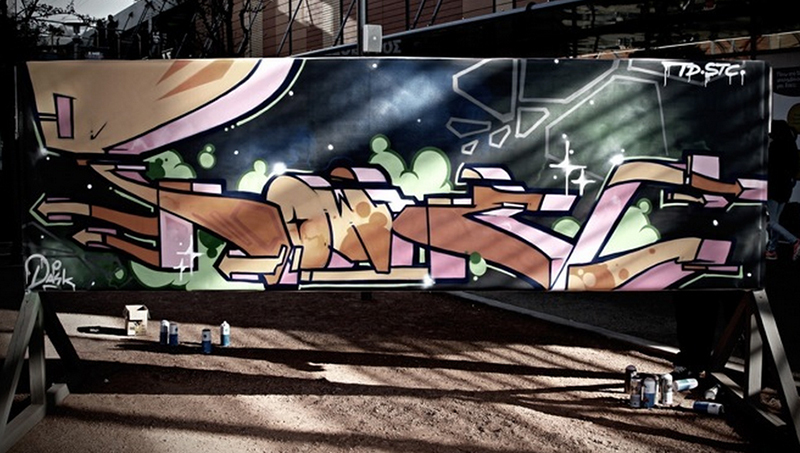 For sure, my style had basis and influences in the graffiti world – that was my background. So I tried to keep the lines bold and the colors spot, but in the same moment, to move away a bit from the funky elements. I wanted my designs and tattoos to have more of a dark atmosphere. This evolved by time passing in something totally different, some call it “graffiti-based neotraditional tattoos.” If we had to put a name in my style, that would most probably be [it]. Has the tattoo game changed in Greece? For real, the tattoo game has changed in Greece as well. People know how to distinguish the tattoo styles and choose the right artist for them. Tattooing is my career and a work you always have to try hard to get better and evolve. The most important thing you receive is the trust the people are giving to you and the fulfillment in the end, not some promotion or bonus from your boss. MANOS: When did you start tattooing and when did you get to know this will evolve into something serious and a career? ROZA: I’ve been a tattoo artist for a little bit over three years now. I knew from the start I wanted to be serious about it! It’s something that I have been drawn to from a young age, and when I got the chance to be part of the tattooing world as an artist, I was in it for good! I feel blessed for doing what I love every day. How would you define your style and what are your influences? Do you also have other favorite artists? My style of tattooing is realistic color tattoos, portraits, and neotraditional. I think it’s because I was influenced a lot by SAKE and DASK (my mentors). Also by other artists such as Nikko Hurtado, Dimitry Samohin, Emily Rose, and Eckel. I also admire the works of Hans Memling, Michael Hussar, and Roberto Ferri. And Shawn Barber. Do you have favorite tattoos you have done? Yes, I do have some favorites! Ha! Usually, when clients give me the freedom to do my thing. I tend to enjoy those tattoos a lot. Also tattooing friends is always fun! !